The National Breast Cancer Coalition is hiring a Vice President of Strategic Initiatives and External Affairs. See below. In 2010, the National Breast Cancer Coalition (NBCC), a grassroots advocacy organization, launched Breast Cancer Deadline 2020®, with a goal of knowing how to end breast cancer by January 1, 2020. NBCC’s blueprint for Breast Cancer Deadline 2020® is a strategic plan of action for knowing how to prevent the development and spread of breast cancer. Since 1991, NBCC has been at the vanguard of the breast cancer movement – elevating breast cancer to an issue of national significance, leveraging billions of federal dollars for research and care, and empowering tens of thousands of breast cancer survivors to become effective advocates for themselves, and for all those at risk of breast cancer. As NBCC approaches its critical Breast Cancer Deadline 2020, the Vice President of Strategic Initiatives and External Affairs will work with leaders across the organization and movement to ensure NBCC achieves its goal of knowing how to end breast cancer. In partnership with the President, the VP Strategic Initiatives and External Affairs will play a leading role in planning for the deadline and designing NBCC’s strategy to end breast cancer long-term. This is an ideal opportunity for someone who is passionate about ending breast cancer to help shape the vision, strategy, and external presence of a premier national breast cancer movement. The VP of Strategic Initiatives and External Affairs’ role will be national in scope, and s/he will be a primary liaison and spokesperson to external constituents and coalition members. The VP of Strategic Initiatives and External Affairs will also manage relationships that impact the organization’s mission and future impact goals across a range of initiatives including the DoD Breast Cancer Research Program and the Artemis Project. Reporting directly to the President, the VP of Strategic Initiatives and External Affairs will be a critical member of the NBCC senior leadership team. NBCC is an equal opportunity employer that especially welcomes applications from breast cancer survivors, women, and people of color. Reasonable accommodations may be made to enable individuals with disabilities to perform the essential functions. Atlanta, Ga. (February 28, 2017) – The Georgia Breast Cancer Coalition Fund (GABCC), a nonprofit organization serving as Georgia’s voice to end breast cancer, is holding a free community event that brings together citizens and lawmakers to discuss the impact of breast cancer on Georgia. “Nearly 9,000 Georgians will be diagnosed with breast cancer this year. This disease is devastating, not only for these women, but for their families and our communities. It is our goal to provide attendees with a unique opportunity to build and enhance their advocacy skills as well as get up close and personal with their elected officials,” said Amy Upchurch, GABCC’s Executive Director. 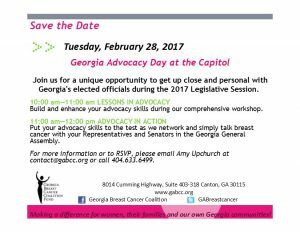 Led by trained breast cancer advocates, the workshop will be held at the Georgia Capitol from 10 am-12 pm on Tuesday, February 28, 2017. The workshop is free, however, registration is required to ensure adequate materials for all attendees. Please register here or call 404-633-6499 for more information. The Georgia Breast Cancer Coalition Fund (GABCC) is a not-for-profit organization dedicated to serving as Georgia’s VOICE to END breast cancer. GABCC has been a leader in advocacy and education efforts since 1994. Through its targeted efforts, the organization has empowered more than 7,500 citizen advocates to join the fight against breast cancer, and has educated legislators at the state and national levels about the importance of enacting legislation to increase access to medical treatment for those diagnosed with breast cancer and funding research for a cure. For information about GABCC, visit our website: www.gabcc.org. Advocacy Works. Are you WITH us? His words still ring true today. If we don’t do anything, we will continue to lose more than 40,000 women and 450 men to breast cancer each year in this country, and 522,000 women around the world. So, what can we do about breast cancer? How can we end this disease once and for all? Although, scientists have discovered a great deal about this disease over the past 30 years, the dialogue about breast cancer hasn’t changed much at all. Awareness masks the hard truths that cannot be made better with a pink ribbon, like the fact that people are still dying. It’s time for a new conversation. We need action. We need real results. We need to end our addiction to comfortable. To easy. To good enough. It’s time to be leaders. True leaders—that means every one of us who want to play a role in knowing how to end breast cancer must take action. We all must find the will, the strength, the belief to do what it takes to achieve the end of breast cancer. For more than 20 years, the Georgia Breast Cancer Coalition Fund has been dedicated to state and national legislative advocacy efforts…fighting to ensure funds were, and continue to be appropriated for breast cancer research and treatment; and to ensuring that all women have access to quality medical treatment for the disease. We lead interactive education workshops throughout the state, arming attendees with key information on breast health, diagnosis, treatment, research and essential advocacy tools. We also work with the Georgia General Assembly and the US Congress to ensure that funds raised actually support programs and services for the families who are affected, both now and in the future. We are working to change the conversation about breast cancer. And you can too. Advocacy is inherently political and attempts to increase the power of the powerless with our elected officials. Advocacy is action aimed at changing the system. And advocacy makes a real difference! In fact, without it, we wouldn’t be where we are in breast cancer today. Successful grassroots advocacy efforts are dependent upon individuals. Not necessarily political experts. But individuals who are passionate about an issue and prepared to make their voices heard. No experience necessary. If you can plead a cause, defend those in need, and speak up for those who choose not to, you are an advocate. Every legislative session brings changes that directly impact access to breast cancer prevention, screening, and treatment. Individuals who are committed to eradicating breast cancer, must be diligent in monitoring legislative changes and making sure that their voices and opinions are heard. Our involvement is essential to make elected officials care about breast cancer issues and take a position. Because only we can effectively explain why we care about breast-cancer related legislation. The legislative process is complicated, but becoming an effective advocate can make a real difference. Are you with us? Are you ready to join us as Georgia’s VOICE to END Breast Cancer? Join us on Tuesday, February 28, for Georgia Advocacy Day at the Capitol. Because together we can change the conversation from awareness and screening, to prevention and saving lives. And together, we ARE Georgia’s VOICE to END Breast Cancer!